If you follow this blog at all you know that my main purpose and goal is to give you encouragement and strengthen you, using God's Word, as you travel through your daily life. My post are on weekdays, but this weekend I wanted to share with you something I feel very passionate about, and that is my marriage. Mark and I have been married 18 years. I can honestly say our marriage, I believe, is greater and stronger and we are more in love 18 years after we said "I do" than any two people should be allowed to be. But it did not just happen overnight. Oh, no my friend. Lots of tears, 'loud talking', and asking for forgiveness have been part of our journey helping pave the road for the wonderful marriage we have today. So I want to let you know about a great five week marriage class taught by Mark beginning Thursday, February 5th at the Alachua Woman's Club in Alachua, Florida. There is no cost but we do need you to register by clicking here. This class will start at 7pm and last one hour. Even if you are not married yet this class is for you. Being prepared today will help prevent many issues from becoming big problems tomorrow. "Every marriage has its ups and downs. It’s all part of the seasons and cycles of having long and lasting relationships. Unfortunately, far too many people give up on the process before they can really discover how beautiful and fulfilling a healthy relationship can be. God knows and understands the struggles we have trying to find contentment and peace in our marriages and He has provided us a blueprint to achieve it. 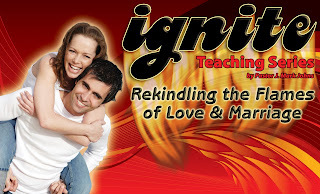 Whether you have a wonderful marriage or your flame is about to flicker out, these five weeks of teaching will change your relationship and ignite the flames of love again." Would love to have you join us! Praying for many marriages to be restored and happy marriages to be better. Oh if only couples would take advantage of these teachings by Godly men & women that have experienced 'life' and heed their scriptural admonition, so much pain could be avoided. God annoint you both as you advance the wonderful relationship of marriage!